Portugal is weeping, Geert Wilders Says Netherlands Would Be Better Off if It Left 28-Nation Bloc, France can't compete with Germany, Merkel is pissed at Obama, Belgium is ousting Afgans. Is anybody happy? A grislier German example of contract limitations. Last May, immediately after Europe's new privacy regulation came into force, noyb [a.k.a. Max Schrems] lodged its first series of strategic complaints -- targeted at what it dubbed "forced consent", arguing that Facebook, Instagram, WhatsApp and Google's Android OS do not give users a free choice to consent to processing their data for ad targeting, as consenting is required to use the service. That's what I said: You get bugged for consent or you get shut off. No options. 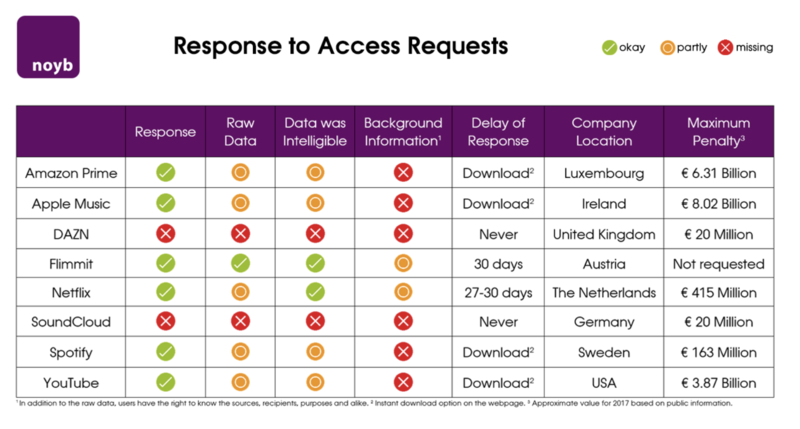 Did somebody say that now, thanks to GDPR, you can ask from the companies to see how your data is used? Here's what it looks like. That's why they got sued the very first day. The courts will give GDPR bite, or not. When the law comes there will be resistance, they will do as little as they can get away with, or even less if there are no significant consequence. It is in many way the private (and some public) surveillance equivalent to Freedom of information laws. Some bureaucracies will comply quickly and fully, others will not, and try to obstruct and subvert. If the law lets them get away with it, they will. Page created in 0.054 seconds with 41 queries.